Millipedes live outdoors in gardens, under piles of dead leaves, flower beds, and under storages sheds; any places where soil tends to stay damp. 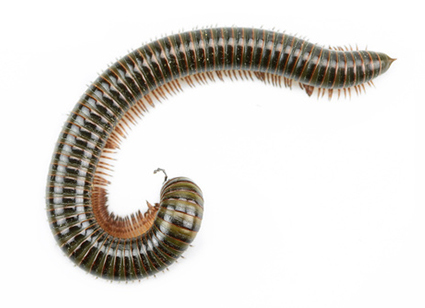 Before winter millipedes migrate, usually into people’s homes. They tend to enter through basement doors and windows, crawlspace vents, and garage doors. Homeowners tend to find millipedes in their basement under furniture or storage boxes, able to remain active in undisturbed areas. Also kitchens, bathrooms, laundry rooms, or any place dark or damp is a primary place to find them. Other than actually sighting a millipede there usually aren’t any distinct signs of their presence.